Katie Williams, Dengie’s Senior Nutritionist, will explain why obesity presents a significant threat to horse health. With the aid of a lifesize model digestive system, Katie will discuss how to manage a horse’s weight and how to promote weight loss effectively and safely. 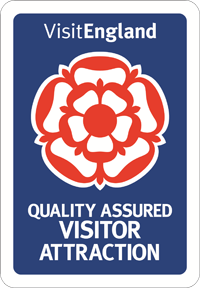 Danielle Gautrey, Dengie’s Regional Manager for the area will also be attending to help answer any of your questions. There will also be a chance to win prizes in a “Guess the weight” competition and Dengie goody bags for all attendees. 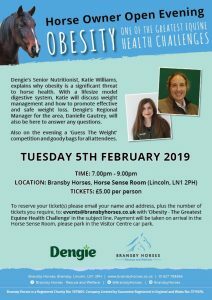 To reserve your ticket(s) please email your name and address, plus the number of tickets you require, to: events@bransbyhorses.co.uk with ‘Obesity’ in the subject line. Payment will be taken on arrival in the Clifford Marshall Building, please park in the staff car park.